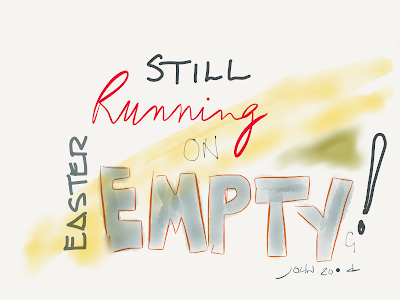 Some thoughts and a short Easter sermon here. Simple enough. Perfectly reasonable on the surface and yet any Parish Priest, Vestry member or disciple knows it’s impossible. I can just see the look on his face. Eyebrows raised a little. Lips pursed and drawn to one side. Looking skyward. Waiting. Rather like the look on Stephen Fry’s Jeeves’ face when he asks Bertie one of his leading questions in the Jeeves and Wooster series. Jesus still asks such impossible questions. Especially when the equivalent of some hungry crowd is bearing down on me. How am I to provide for their needs? And there you are. There we are in our little Anglican (or fill-in-the-blank) churches. Jesus testing us to see if we’ve been paying attention. Reminding us that somewhere close by there is someone like that little boy—or a little girl in the crowd, a teenager or an elderly saint nobody pays much attention to in our congregation—someone with something Jesus knows the crowd, or its equivalent, needs. If only I, like Andrew, could see them. Impossible. What they have never seems to be enough and is usually not neatly sliced. But when obediently and prayerfully placed in Jesus’ hands, they become a miraculous cornucopia of blessings. More than ever you or I could ask or imagine. 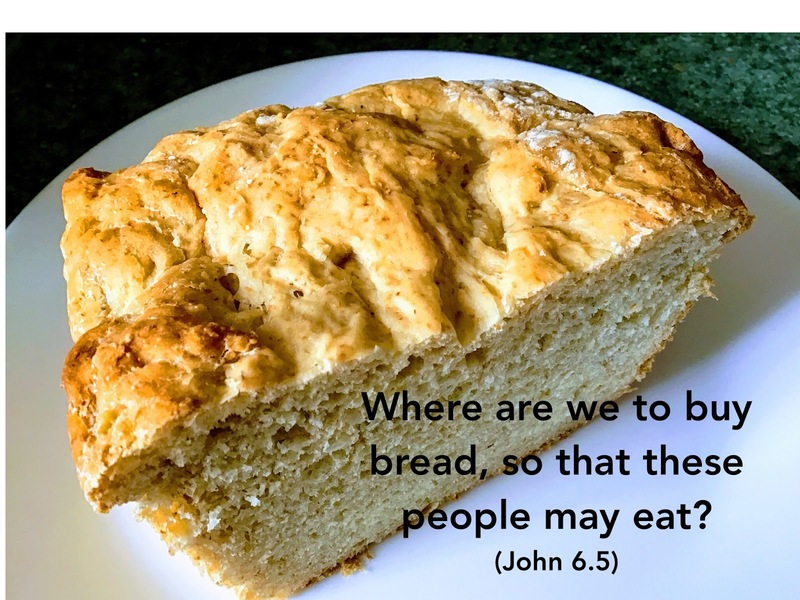 And once Jesus has finished doing that infinitely more thing he does so well we are left amazed—wondering what on earth to do with the leftovers. I’ve got to get better at listening for those questions, keeping my eyes open, handing what I see over to Jesus, doing what he says with it and preparing to deal with lots of leftovers. So do we all. 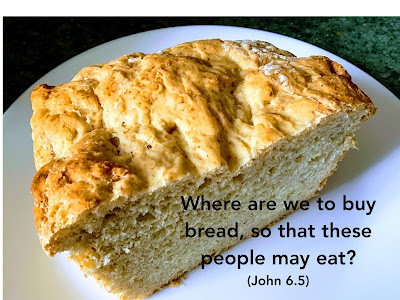 You never know when The LORD—the God and Father of our Lord Jesus Christ—might decide to rain bread and glory (Ex 16.4, 7), or some other thing or blessing he has waiting in the heavens for whoever is bearing down on us hungrily. What might might help me to do that? The other two readings have some pointers. Stop my grumbling (Ex 16.2, 7, 8) and do what I’m told. Live free and in the Holy Spirit (Gal 4.26-5.1, Ro 8.2) rather than letting myself be hobbled and spiritually paralyzed by fleshly desires and habits. No matter how I slice it, Lent is a good time to work at that by honing up my spiritual disciplines and fanning my Holy Spirit-given gifts into flame “by self-examination and repentance, by prayer, fasting, and self denial, and by reading and meditation upon God’s holy Word” (BCP, p612). Note: I realize that not many of you would have heard the gospel lesson we did at St Mary the Virgin in Regina last Sunday. Canon Claude Schroeder, our Rector, uses the BCP Epistles and Gospels during Lent. He believes that they have a important and consistent seasonal theological integrity. I’m inclined to agree. So we heard Ex16.2-7, Gal 4.26-5.1 and John 6.5-14 rather than the RCL’s readings o the day. A SaskLent: Snatched from the Jaws of Safety and Comfort in the Nick of Time—Again! Jesus, who sets out and knows all our paths and resting places (Ps139.2), led us here to King’s Cottage in Regina. After a few months of wintery settling in we are now observing our first SaskLent in this new season of our lives (there are many “Sasky” things in Saskatchewan—SaskTel, Energy, Power, Jobs, Health, Sports—you name it). Our SaskLenten self-examination will be a continuation of all the self-examining (and some self denial) that the move visited upon us as we left family and friends behind, culled our worldlies by a third and began the process of discovering what it is to settle into a new church and community where we haven’t come for the purpose of assuming some “official” role. We’ve been rather SaskStripped down exposing some emotional and spiritual nerves I didn’t know I had. As those nerves continue to jangle the rest of our Lenten disciplines of repentance, prayer, fasting, reading and meditation upon God’s holy Word (BCP, p611) are making for commensurate and somewhat gnarly devotional fare. The dangers of life are many and safety is one of them. As I reflect on the life we’ve left behind with all its comforts, familiarities and securities I wonder if this new jangled and rather disconnected state of affairs is actually a God-given escape from a dangerously safe situation? If so, I wonder why I’ve made so many such escapes from safety and familiarity in my life? Immigrating from New Zealand in 1974, moving from Winnipeg to Calgary in 1980, from Calgary to Saskatoon and seminary in 1988, to Airdrie and our first parish in 1991, Medicine Hat and St Barnabas in 1999—and now this. I must have unwittingly faced and escaped from a lot of danger in my life. Snatched from the jaws of safety and comfort in the nick of time—again! And so here we are. Eyes front and wide open. Looking to the future. Wondering what’s next after having just been through our personal Medicine Hat to Regina version of The Gentle Art of Swedish Death Cleaning: How to Free Yourself and Your Family from a Lifetime of Clutter. We've been SaskStripped and immersed in SaskLenten self-examination, repentance, prayer, fasting, reading and meditation upon God’s holy Word. It's SaskGnarly, SaskNerve-wracking, SaskExciting and very SaskGood all at once. Jesus is LORD! And he will remain so no matter what. Councils of the Church come and go as do General Synods. We get it right and we get it wrong. Consistently. Participating in the Councils of the Church can be discouraging. Not long after we accepted the call to St Barnabas in Medicine Hat in 1999 I decided (I hope with The LORD’s prompting) I needed a Spiritual Director. Since I could find no one who had set up shop in The Hat and didn’t want to drive to Lethbridge or Calgary, I decided I’d just approach one of the Roman Catholic priests in town and ask if he’d take me on. Why Catholic? Because Spiritual Direction is in their DNA. When a postulant for the priesthood arrives at a Catholic seminary he is assigned a room and a Spiritual Director. So I approached Fr Wendolin Rolheiser at what was then Christ the King Roman Catholic Church. He wasn’t keen on the idea and no wonder. Catholic priests tend to deal with huge congregations. They have more than enough on their plate. Eventually, praise God, he agreed to take me on and he was excellent. A great blessing. Why am I telling you this story? Because, in one of our early sessions he gave me a book to read that his brother, Ron, had written. “Oh, no!” I thought. Now I have to read this book by somebody I’d never heard of and I probably wouldn’t like it and I’d have to say nice things about out of politeness for Fr Wendolin’s sake. The book was Seeking Spirituality: Guidelines for Christian Spirituality for the Twenty-First Century (Hodder & Stoughton, 1998) and it was excellent! Ron Rolheiser is also a priest. He and Wendolin were born and raised in Saskatchewan. Fr Ron is now the President of the Oblate School of Theology in San Antonio, Texas, and the author of many books. He continues to write columns of spirituality and faith on his blog (http://ronrolheiser.com/en/) and for publications all over the world. It’s true, of course. The Lamb wins. So let’s enjoy that truth as we pray through Lenten Ember Day 3 today. The Church waxes and wanes in its faithfulness. So do you and I, but never Jesus. 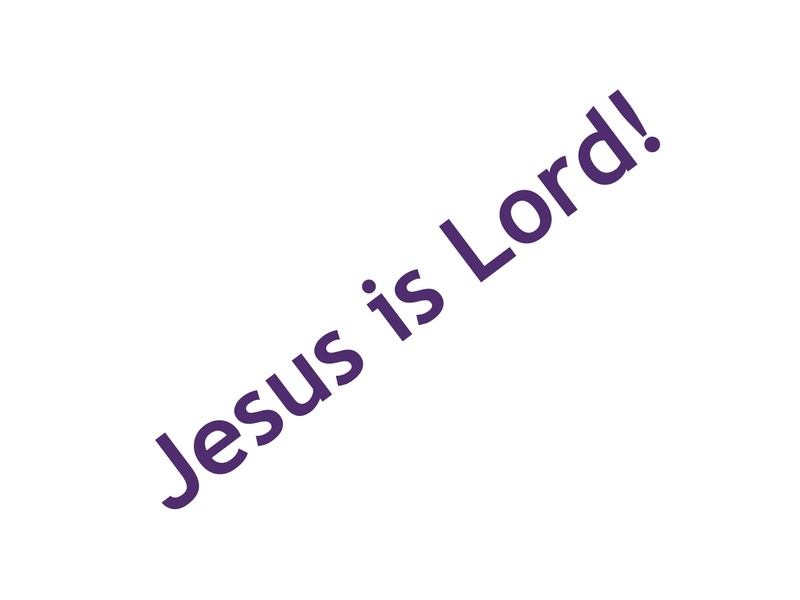 Jesus is perfect. The Church is not. Yet. If you or I were ever to find a perfect one we’d ruin it by joining it someone said or wrote. I’ve experienced plenty of the imperfections and contributed to them, too. But I’ve experienced more of the goodness—quiet encounters, moments in worship, joyful baptisms, weddings and funerals—where, because of perfect Jesus, imperfect people in an imperfect institution manage to embody and deliver the steadfast love of The LORD and his grace and mercy, too. It can be grand and most often is! I took the photograph above on my iPhone a few weeks ago while waiting for that door to be opened for Evening Prayer. The trees and the shadows of the branches seeming to grow out of the door caught my eye. I thought of the Tree of Life and the door to salvation. But when I posted it on Instagram and Facebook, Karen Brantnell, a Calgary friend, commented, “Release the kraken! Sorry, not so spiritual, but it totally looks like that!” It’s true! There is a rather spooky element of darkness there. Which, upon reflection I realized, is a true and accurate depiction of the church. There’s light and beauty, but the light casts shadows. If I focus on the shadows—the imperfections, the failings, the people who get up my nose, who I think are wrong and who are leading people astray, I might leave slamming that door behind me or just not bother going through it at all. There’s a lot of both going on these days. Which brings me to Lent and Ember Day two. Pray through the darkness within and without. The tree of life was in the midst of the Garden of Eden (Gen2.9). It was pleasant to look at and good to eat. The tree of the knowledge of good and evil was close by. Eve noticed it, too, was good for food, a delight to eyes and most desirable so she and Adam ate some (Gen3.6) thereby releasing the Kraken and unleashing the darkest shadows ever. You and I still encounter many things which are a delight to look at, touch and taste, and which seem so good and gratifying. The devil is still at work prowling, lying and whispering in our ears, “Did God really say that? That can’t be right. That’s not very inclusive or tolerant. You need this. Love is love, after all.” And when we yield to that temptation and we take and eat we, too, enter the shadow world of sin and death. 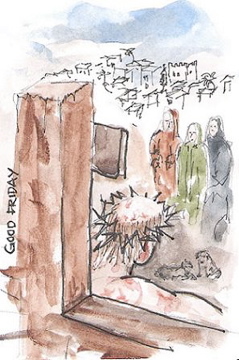 Today is the first of THE LENTEN EMBER DAYS (BEING THE WEDNESDAY, FRIDAY AND SATURDAY AFTER THE FIRST SUNDAY IN LENT)—the second to last set before General Synod—by which we are called to honestly and fearlessly allow ourselves to be “put in mind of the message of pardon and absolution contained in the Gospel of our Saviour, and of the need which all Christians continually have, of a renewal of their repentance and faith.” (BCP, p612) That kind of renewal is the beginning of the Anglican Renewal Ministries Canada kind. It begins with us—you and me—before we go calling others to account. Good Lenten self-examination will honestly address the many temptations that come my way and yours. Last Sunday our priest at St Mary the Virgin, Canon Claude Schroeder, preached on the Temptation in the Wilderness in Matthew 4. He was kind enough to list eight thoughts that tempt: Gluttony, Fornication, Avarice, Sorrow, Despondency, Anger, Vainglory and Pride. He pointed out that such thoughts can pop into our minds unbidden. That they come is not a sin, but what we do with them can be. When they come, they pierce—a word with the same root as “tempt”—they get in amongst me where, if entertained and acted upon, they become sin and death for me. Sorrow, despondency, anger and pride can all be particularly gnarly and potentially sinful responses for me when it comes to people with whom I disagree and who I’m convinced are headed out from under the umbrella of Scriptural truth and are taking others who don’t know any better with them. So I examine self as carefully and honestly as I can. In doing so I hold up a divine mirror to try and get a glimpse through the weeds of my sin (Mt13.24-30) of the log in my own eye (Mt7.1-5). I repent (over and over again) and my repentance is renewed. I pray and fast. I read and meditate. In doing so I take up the shield of faith with which to extinguish and deflect the flaming darts of the evil one (Eph6.16) which pierce and tempt and will lead to sin and death if I let them. And my faith is renewed.